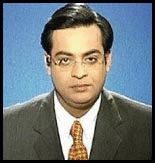 Chagatai Khan: ARY NEWS Hires a Murderer & Blasphemer (Aamir Liaquat Hussain). ARY NEWS Hires a Murderer & Blasphemer (Aamir Liaquat Hussain). 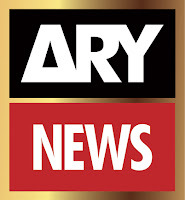 Famous Religious Anchor & politician Aamir Liaquat Hussain has Joined ARY Network. He left Geo TV at very important stage when Ramzan are less than week ago. He joined ARY Group as executive Director of QTV. He will host program from QTV & also conduct Ramzan special program. He is famous because of his Islamic show “Aalim Online” which was came from Geo TV & Geo News. We may see him in special Sehri & Iftar transmission in whole Ramzan. QTV team, Salman Iqbal & Dr. Shahid Masood Gave him congratulation for joining ARY Digital Network. The MQM has announced that the popular religious TV person, Amir Liaquat Hussain, is no longer a member of the party’s Rabita Committee because he is making statements that arouse “religious hatred”. The announcement specified that he had been “warned earlier to stop making such statements on his television programme”. The MQM actually said that owing to his inclination to arouse religious hatred “his party responsibilities were ended one and a half years ago and his membership was suspended as well”. Now the MQM doesn’t want to be “responsible for any of his words and deeds”. QUESTION: -- talking – walking the walk instead of just talking the talk? Daily Jang/GEO/The News International: quoted UK Newspaper The Guardian Tuesday, October 19, 2010, Zi Qad 10, 1431 A.H http://www.jang.com.pk/jang/oct2010-daily/19-10-2010/u49869.htm which predicted the End of Democracy in Pakistan and also quoted British News agency: Tuesday, October 19, 2010, Zi Qad 10, 1431 A.H http://www.jang.com.pk/jang/oct2010-daily/19-10-2010/u49880.htm that MQM's separation from the Federal and Provincial Government is on the Card - But Jang has completely forgotten as to what the same Guardian has written on Jang/GEO TV anti Minorities Role regarding massacre of Ahmedis in Lahore and this Anti Minority Frenzy is promoted by a Jang Group/Geo TV Employee, Aamir Liaquat Hussain and Jang also forgotten as to what the same Guardian has written on MQM? Aamir Liaquat Hussain also use "Blasphemous Language against the Companions [May Allah be pleased with all of them] of Prophet Mohammad [PBUH] - Watch his insulting comment on Sahaba Kiram after Guardian's Story. 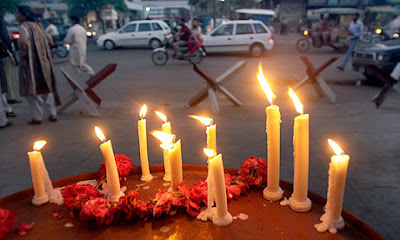 Candles were lit by members of a civil society for victims of the attack on the Ahmadiyya sect in Lahore. Photograph: KM Chaudary/AP - I often find myself defending Pakistan against the unbidden prejudices of the outside world. No, Islam is not the cause of terrorism. Yes, the Taliban is a complex phenomenon. No, Imran Khan is not a major political figure. This past week, though, I am silent. The massacre of 94 members of the minority Ahmadiyya community on May 28 has exposed something ugly at the heart of Pakistan – its laws, its rulers, its society. It's not the violence that disturbs most, gut-churning as it was. During Friday prayers two teams of attackers stormed Ahmadiyya mosques in the eastern city of Lahore. They fired Kalashnikovs from minarets, chucked grenades into the crowds, exploded their suicide vests. As the massacre unfolded, a friend called – his father-in-law, a devout Ahmadi, was inside one of the besieged mosques. The family, glued to live television coverage, were sick with worry. Two hours later, my friend's relative emerged alive. But many of his friends – old men, including a retired general and former judge – were dead. The killers were quickly identified as "Punjabi Taliban" – a loose collective of local extremists with ties to the tribal belt. This was unsurprising. More dispiriting, however, was the wider reaction. Human rights groups reacted with pre-programmed outrage; otherwise there was a virtual conspiracy of silence. A dribble of protesters attended street protests against the attack in Lahore and Karachi; eleven people showed up in Islamabad. The normally vociferous media were unusually reticent. Commentators expressed dismay at the violence, but few dared voice support for the Ahmadiyya community itself. Politicians turned yellow. Few visited the bereaved; still today, the chief minister of Punjab, Shahbaz Sharif, has not visited the bullet-pocked mosques or offered compensation to the injured. In the national parliament, three brave female MPs crossed party lines to propose a resolution condemning the attacks, in the face of massive indifference. The motion passed, just. The reticence is rooted in law and history. Ahmadis believe that Mirza Ghulam Ahmad, a 19th century Punjabi cleric, was the messiah sent by God – a notion that deeply offends orthodox Muslims for whom Muhammad, who lived in 7th-century Arabia, is the final prophet. The problem is that the state has taken sides in this religious argument. Since the 1970s, civilian and military governments have passed laws enshrining the discrimination against Ahmadis, today thought to number about 4 million in Pakistan. And so they live in the shadows of society. Under the law, Ahmadis may not call themselves Muslims and may not refer to their places of worship as "mosques". Orthodox Muslims applying for a passport must sign a statement deriding Ahmad as an "imposter". Any Ahmadi who defies these edicts can be sentenced to death; in 2009, 37 were charged under the blasphemy laws and 57 under Ahmadi-specific laws. GEO TV raise hue and cry over almost everything whereas their very own key "Religious Scholar - Mr. Aamir Liaquat Hussain" is indulged in “Tabbarra Against the Companions of Prophet Mohammad (PBUH)” (Insulting Comments against the Companions of Prophet Mohammad - PBUH). Had Daily Jang quoted Quran and Hadith on Beard then it wouldn’t have been a problem but lecture on Islam from a TV Anchor who doesn’t even know about the “Status” of Companions [Sahaba Kiram] would not be acceptable to any sane person. Watch and lament. KARACHI, March 9: He is the most high profile Parliamentarian of Altaf Hussain’s Muttahida Qaumi Movement (MQM) and is also projecting himself as Altaf Bhai’s successor, should something happen to the MQM leader in London. He is the blue-eyed boy of General Pervez Musharraf as the General telephones him after hearing his dramatic preachings on the TV. He is the most versatile preacher of Islamic values and morals on home TV screens round the clock. He is a prolific speaker and a successful fund-raiser for charities. He is a junior Minister for Religious Affairs in the huge cabinet of Prime Minister Shaukat Aziz. 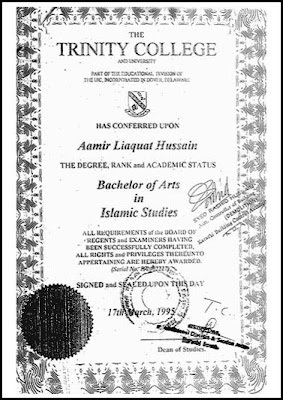 But in addition to all these qualifications, young, dapper and the stylish member of the National Assembly from Karachi, "Dr." Aamir Liaquat Hussain, is a fake and a fraud. Prof. Aqil, however, did leave some elbow room by stating in his letter that the authentication was “provisional” and the final decision would be conveyed to the applicant in due course of time. That decision was neither needed nor taken nor conveyed to anyone as Dr Aamir had used the provisional certificate to get himself elected to the Parliament and the matter was forgotten. 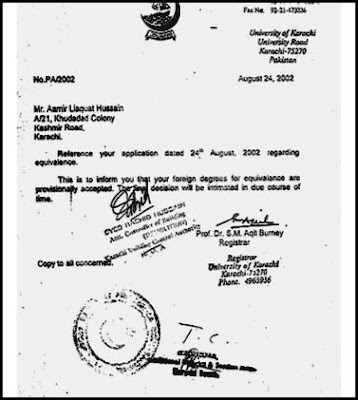 When the newspaper contacted Prof Aqil later to ask how he could issue the authentication without referring the documents to the Karachi University’s Equivalence Committee, he admitted that Dr Aamir had come to him with degrees from some Spanish University and since these were not degrees issues by his University, he authenticated them on the spot. His answer was unconvincing to say the least. 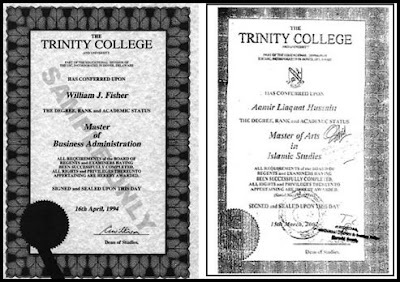 Prof Aqil kept no record of these degrees and when the newspaper contacted the current Registrar to verify whether any such record was kept, no one could trace the file, as none existed. 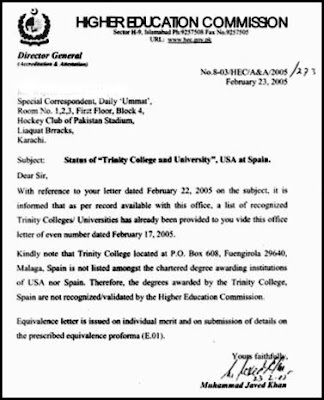 When the newspaper contacted the Higher Education Commission in Islamabad, the official authority on the matter, to verify whether the Trinity College & University of Spain, which issued the degrees to Dr Aamir, was a recognized institution by Pakistan, Director General Mohammed Javed Khan informed the newspaper vide a letter Dated February 23, 2005 that the Trinity College was not recognized. The letter confirmed the forgery of Dr Aamir and abetment in the forgery by Prof Aqil to facilitate his candidacy in the election. 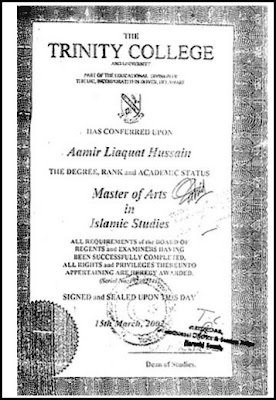 Daily Ummat also obtained copies of the degrees Dr Aamir presented to the Election Commission and during the investigation found that the Trinity College had placed exactly similar samples on its web site, offered the same day for a price. The investigation leaves Dr Aamir Liaquat Hussain, MQM Chief Altaf Hussain and General Pervez Musharraf in an embarrassing political dilemma. Musharraf has been promoting Dr Aamir as the heir apparent of Altaf Hussain himself and the way his curve was rising was creating serious apprehensions within the MQM circles as well. For Musharraf it would be a triple disaster in just a few weeks as Dr Aamir would be the third cabinet minister who has been caught literally with his pants down in the middle of the road. His supporter, PPP rebel and currently a minister, Faisal Saleh Hayat, has already been asked by the Prime Minister to resign as his bail application was cancelled by the Supreme Court and National Accountability Bureau has to arrest him for unpaid loans. Many other candidates in the 2002 elections were disqualified because they were defaulters of loans but not Faisal. Interestingly just before the Supreme Court decision to cancel his bail, Faisal Saleh Hayat slipped out of the country and is now residing in London, considering his options whether to return to Pakistan and land in a jail or stay away. 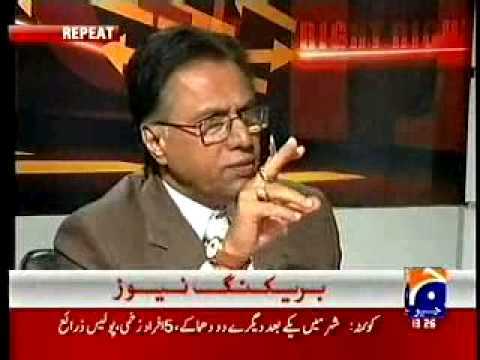 Another serious embarrassment for Musharraf has been the Health Minister in the Punjab Cabinet, Dr Tahir Javed who absconded from Nebraska after causing the worst Hepatitis C outbreak in US history and who had forced his insurance company and the State of Nebraska to pay millions of dollars to his victims who sued him. Now the show boy of Musharraf, Dr Aamir Liaquat Hussain is in the dock. Scores of seasoned politicians, including former minister Syeda Abida Hussain of Jhang, were either disqualified or did not contest the 2002 polls because they did not have graduate degrees. Now we find that some of those who did, committed a fraud with the law and the people. The biggest embarrassment would, however, be for his GEO TV channel because he hosts a program which is supposed to teach moral values to its viewers. The host has now proved to be an immoral person himself. Shocking TV interview haunts Dr Aamir Liaquat’s career Daily Times Monitor Daily Times - Site Edition Thursday, May 26, 2005 ISLAMABAD/WASHINGTON: President Pervez Musharraf’s favourite Islamic TV preacher, the minister of state for religious affairs, Dr Aamir Liaquat Hussain, has finally shot himself, not in the foot but almost in the head, South Asia Tribune reported on Wednesday. 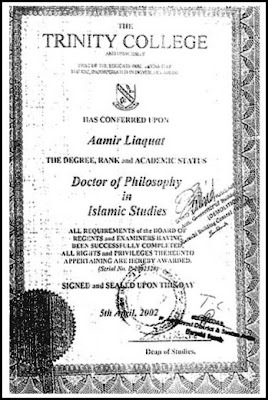 “The minister, who was already in trouble over his allegedly fake degrees scandal and his sharp criticism of the Pakistan Army and Inter-Services Intelligence (ISI) and is being replaced by the Muttahida Qaumi Movement (MQM), despite all his denials, went on record in a TV interview last week and said Pakistan supported Iraqi insurgent leader Abu Musab Al-Zarqawi and what he was doing to US forces in Iraq,” it reported. “Aamir said this in an interview to ARY’s famous host, Dr Shahid Masood, on the subject of a fatwa (decree) issued by some Pakistani religious scholars recently, on whether suicide bombing was permissible in Islam. Aamir had been called to discuss the fatwa along with senior Muttahida Majlis-e-Amal leader Hafiz Hussain Ahmed,” it said. “The young and inexperienced minister, a loud-mouth who offends listeners, said such ‘truthful’ things about Pakistan’s policy on jihad in Iraq and Kashmir and even so strongly blasted President Musharraf for supporting the US that ARY TV decided not to run the programme on popular talk show Views-on-News,” South Asia Tribune added. Hafiz Hussain Ahmed, who was the other guest on the talk show, was shocked out of his senses when he heard the comments of the minister during the interview. He asked Aamir several times whether he was speaking in his personal capacity or on behalf of the MQM or the Musharraf government. When he was told that he was representing the government’s point of view, Hafiz Hussain Ahmed reportedly could not refrain from making the following remarks: ‘If this is what enlightened moderation of General Musharraf means, who in hell can oppose it. The MMA will fully support the MQM and Musharraf if this is the official policy’,” it said. “The whole show became so ridiculous that ARY decided not to run it, but the tape immediately became a hot potato and was soon in tremendous demand from all interested parties,” South Asia Tribune reported. Hafiz Hussain Ahmed confirmed the story of the censored TV show to South Asia Tribune. It quoted him as saying that he was shortly going to protest to the ARY TV Channel for not running the interview, as the minister had repeatedly said that it was the official government policy. “The minister agreed with all the points that I raised and all the arguments for jihad that I made and concurred that it was jihad being fought by Muslims in Iraq and the Pakistani government supported it. I was so surprised that I told him on record that if this is the meaning of enlightened moderation of General Musharraf, we (the MMA) are with you and kon kambakht mukhalifat kar sakta hay (which Godforsaken soul can oppose it),” it quoted him as saying. “ARY officials in Dubai and Islamabad refused to say why the interview had not been shown but Hafiz Hussain Ahmed said he would be protesting to the channel and urging them to release the tape as it would open the eyes of the world,” South Asia Tribune reported. “When Hafiz Hussain Ahmed started asking questions about the interview, the secret service got wind of what had happened and immediately demands were made from the ARY administration to let the authorities have a copy of the dreaded tape,” it said. “Surprisingly, the London headquarters of the MQM also got wind of what had happened in the interview and Altaf Hussain, who had already summoned Aamir Liaquat Hussain to London, also started looking for a copy of the tape,” it added. South Asia Tribune quotes US diplomatic sources in Islamabad as telling it that they had heard about the interview and that they would like to hear the tape and what the minister had said about President Musharraf’s policy about suicide attacks by Zarqawi’s men on US forces. It quoted sources as saying later that Pakistani authorities had informed the US diplomats about the contents of the interview and everyone might soon be watching the tape of the interview. “Whether President Musharraf, Altaf Hussain or the US diplomats have received the cassette and heard Dr Aamir’s comments or not is not yet confirmed, but experts in Islamabad said it is only a matter of time that everyone concerned will hear what this outspoken minister had to say and then the chips would fall where they may,” it added. South Asia Tribune quotes sources close to Hafiz Hussain Ahmed, who heard the minister in awe during the interview, as saying that the minister had become emotional while talking about jihad and suicide bombings and was grilled by the host of the programme, Dr Shahid Masood, who almost trapped him into making statements which no politician in such a high political position would make. It quotes the sources as saying that Aamir had openly criticised President Musharraf for his pro-US policies and had fully supported the jihadis in Iraq, Palestine and Kashmir, but at the same time he had insisted that suicide bombings in Pakistan were against Islam. “‘Anywhere, if there is one American soldier present, suicide bombing is permissible in Islam,’ Dr Aamir was quoted by these sources as having said on record. ‘There are times when the truth must be told,’ he added in one remark,” South Asia Tribune reported. “The minister was the main sponsor when about 50 Pakistani religious leaders issued the fatwa against suicide bombings in Pakistan, which according to some analysts, was done to please President Musharraf. But in his exuberance the minister was caught on the wrong foot when questioned by ARY and Geo TV Channels about such attacks in Iraq and other places,” it added. South Asia Tribune quoted sources in London as saying that MQM Chief Altaf Hussain had already been told by the army to name a replacement for the minister, as he had become too controversial and out-spoken in his remarks and it was difficult to keep him at the cabinet post. “He claimed that the MQM was getting funds from Iran,” South Asia Tribune said. Dr. Aamir Liaquat Hussain of Aalim Online [a TV Program of Geo TV] has repeatedly incited several times, urging Lunatic Muslims [even in the Mullah State the authority to punish anybody rests with the State not with the individuals] to kill without fear. While on air the anchor person also pressured the other two Islamic scholars (from two different sects) on the program to support the statement. This resulted in a unanimous decision among the scholars, on air during a popular television show, to urge lynching with the intent to kill. The Asian Human Rights Commission (AHRC) has received information that an anchor person working for a prominent television channel has incited Muslims in Pakistan to kill - to devastating effect. The targets are followers of the Muslim Ahmadi sect, a group which has been declared non-Islamic under the constitution of Pakistan. The first killing happened within 24 hours of the broadcast, and just under two days later a district chief of the Ahmadi was murdered. Followers of the religion are understandably frightened, and many have left their homes and are taking shelter at their central mosque, the Rabwa. 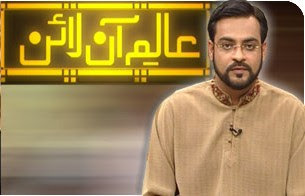 In a program aired on 7 September 2008 the anchor of the religious program 'Alam Online', Dr. Amir Liaquat Hussain--also former federal minister for religious affairs--declared the murder of Ahmadi sect members to be necessary (Wajib ul Qatal) according to Islamic teachings, because its followers don't believe in the last prophet, Mohammad, peace be upon him. Dr. Amir repeated his instruction several times, urging fundamentalists Muslims to kill without fear. While on air the anchor person also pressured the other two Islamic scholars (from two different sects) on the program to support the statement. This resulted in a unanimous decision among the scholars, on air during a popular television show, to urge lynching with the intent to kill. This was not a one-off. On September 9, Mr. Hussain answered a query with the comment that blasphemers are liable to be put to death. According to the information received, at 1:15pm on September 8, 18 hours after the broadcast, six persons entered the Fazle Umer Clinic, a two-story hospital at Mirpur Khas city and two of them went to the second floor and started pressuring 45 year-old Dr. Abdul Manan Siddiqui to come downstairs to attend to a patient in crisis. Dr. Manan left his office and descended into an ambush. He was shot 11 times and died on the spot. His private guard was also shot and is in a serious condition. A woman was also injured by firing. The killers remained at the hospital until the doctor was declared dead, then they walked out of the building's front entrance. Police registered the killers as unknown. On September 9, 48 hours after the broadcast, Mr. Yousaf, a 75 year-old rice trader and district chief of the Ahmadi sect was killed on his way to prayer in Nawab Shah, Sindh province. Yousaf was fired on from people on motor bikes, and sustained three bullet wounds. He died on the way to the hospital. The assailants had taken a route past a police station. No one was arrested. The Ahmadi sect was declared non-Islamic sect on September 7, 1974, through a constitutional amendment, and was labeled a minority sect. Since then, there has been open hatred of the sect by certain Islamic circles and fundamentalists across the Muslim world, and sect members suffer widespread discrimination. Ahmadi followers are not allowed to bury their dead in the ordinary grave yards of Muslims, and many of those buried before 1974 were shifted by fundamentalists. Since 1984 (when statistics have been compiled) around 93 Ahmadis have been killed for their allegiance to their sect, with four killed so far this year, including Dr. Ghulam Sarwar on March 19 in Faisalabad, Punjab province and Mr. Basharat Mughal on February 24 in Karachi. The Dr. Siddiqui is the 15th medical doctor killed since 1984. Please write to following authorities and urge them to appropriate actions in order to stop the killings of Ahmadi followers and recognized religious freedom. Please also demand them to prevent any religious hatred or discrimination from broadcasting through the media. Please be informed that the AHRC has also written separate letter to the UN Special Rapporteur on freedom of religion or belief. very detailed and all in one place.love reading your extensive research and thorough analysis.